Hassle free training and timely assessment of candidates. Using our training and assessment feature, you can train consultants on the required skills and place them at the clients place. 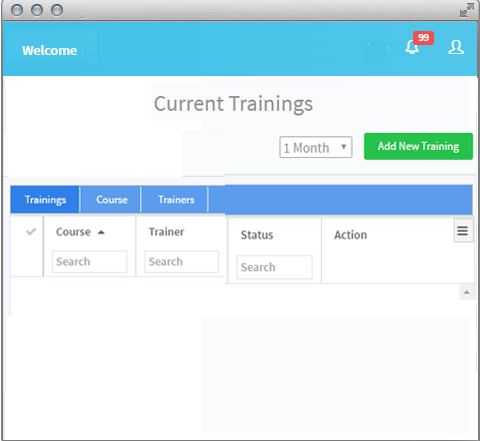 Trainers can manage the list, schedule the trainings, send announcements etc. We also cater to the HRM needs of Recruitment firms through a wide range of offerings. We at Techno HRM have realized the need of a SaaS platform that could exclusively meet all the challenges faced by the IT staffing companies - based on both bench sales and recruitment. Techno HRM serves as an all-in-one smart solution that can be seamlessly used by the staffing companies for their pre and post placement HR needs. © 2016 Techno HRM. All rights reserved.